In this exclusive interview, Wersching talks about Renee’s arc and what it’s like to do two years of 24. Annie Wersching: I was getting hints of that toward the end of the season, but when the season was over, it wasn’t official yet as far as in writing or anything like that. I was actually up for new shows and then I was offered a couple of shows, so we had to go to them and say, “Hey, we need to sign on the dotted line.” So they did. 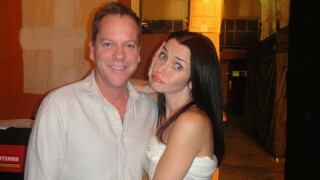 iF: So your preference was to return to Renee on 24, rather than take a new acting job? Annie Wersching: Yes. It’s such a great show. It’s such a great role. iF: Did you guess from the first few episodes of last season that Renee’s arc was going to wind up adopting some of Jack’s methods, as far as torturing suspects to get information? Annie Wersching: I knew it was going to be her struggle and her battle for the whole season, but even up to the very last episode in her last scene with Jack, she still is saying, “Please, what do I do? Tell me what to do.” And he actually says, “Don’t do it. Don’t do anything you can’t live with, because I know what it’s like,” living with those decisions that he had made. I knew it was going to be her whole struggle and her whole conflict for the whole season, but I wasn’t sure exactly where it was going to go. iF: How would you describe Renee at the start of this season? Annie Wersching: She knows that Jack survived [he appeared to be fatally ill at the end of last season] and it actually comes out that he called her quite a bit after he was healthy and she was not returning his calls. After everything that happened at the end of Season Seven, she lost her job at the FBI and she’s in a very dark place. iF: How much time has passed between Seasons Seven and Eight? Annie Wersching: Two years maybe. iF: Are you getting to interact with Cherry Jones at all? Annie Wersching: I’ve had a little tiny bit with her this year, but it’s mostly me and Jack [laughs]. iF: Kiefer Sutherland is both the star and one of the executive producers on 24. What’s it like playing opposite one of the bosses? Annie Wersching: It’s funny, because I usually forget about that part. I mean, obviously, he’s got so much influence creatively on the show and I would say you see it most in that he cares about every single little detail, wanting it to be authentic to the T. You pick up on that. Obviously, he’s very involved with the dialogue and making sure it’s authentic, so it’s nice. But he also just seems like a very dedicated actor. iF: Have you gotten to go to New York for any of the exterior location shoots this season? Annie Wersching: I have not. So far, Kiefer’s been the one who’s actually gotten to go there. We wished we could have shot there a lot more. So instead, we just had to find shots here [in Los Angeles] that didn’t have a palm tree in it and had some pigeons [laughs] and try and make it look like New York. It’s not too hard – we usually went downtown in some gross alley or San Pedro in a warehouse. iF: Have you ever found yourself physically and/or vocally exhausted from all the punching and screaming and crying? Annie Wersching: Actually, no. I was usually begging for them to let me do more stunts. I just love all of that, the running and the fights and being buried alive [laughs] – I love all that stuff. iF: How much of the buried alive sequence did you do last season? Annie Wersching: I did everything, except they wouldn’t let me do the rolling into the ditch. But I was covered with dirt. It was actually the un-burying that was the scariest, because I had to be under there long enough for Bill Buchanan [played by James Morrison] to dig through the dirt, rip the plastic, do CPR and I had the weight of the dirt on my head. iF: Did they have a breathing apparatus for you in there? Annie Wersching: They had a little tiny tube that was bringing in a little oxygen. I ended up not being able to tell. It was easier to just hold my breath [laughs]. iF: So are you hoping nothing like that happens this season? Annie Wersching: Actually, no. I love that stuff. I love all of the extreme things that I got to do and that I get to do and I love anything that’s something you’d never get to do in your normal life, which hopefully that will be something that I never do in my normal life [laughs]. Annie Wersching: Well, I guess we’ve been running in things that are supposed to be tunnels, but it’s usually just made to look like a tunnel. We’re on stages or on location, but not actually in tunnels. I know we were shooting where there were tunnels – we were like in old L.A. theatre actually that had a lot of underground rooms. iF: Do you have a favorite episode or scene? Annie Wersching: It’s the second hour on the second night [where cuts off the thumb of a Russian criminal with a power saw in order to remove a house arrest band]. I was a little bummed about that at first, that I wasn’t in the first three episodes, but episode four – she [came] back with such a bang and it’s so intense and so crazy that that’s one that definitely sticks out. I have some other crazy stuff that happens in episode seven. Those two are jumping out right now to me. iF: Anything else you can tell us about the new season? Annie Wersching: I like that Renee has a new look this year. It’s just a little more roughed up. She’s got her hair up and it’s just kind of messy, darker eyeliner. Because you get stuck with the look for the whole year, so it’s a pretty big deal to decide on what that’s going to be. They wanted me to cut my hair, they wanted me to cut it really short and messed up, like I’d taken scissors myself to it and I was like, “Mm, I don’t know about that. What about putting it up so it looks like that, so then if you want to take it down, you can take it down.” So luckily it worked with just having a messy up-do, which is fun. iF: Do you have any other upcoming projects? Annie Wersching: I did a little independent film in between the two seasons called Below the Beltway with Sarah Clarke, who played Nina Myers, and Xander Berkeley, who played George Mason. iF: Were you all swapping 24 stories? Annie Wersching: Yeah, actually. I was a huge fan of the show, so obviously I watched the seasons that they were on. So that was fun. Other than that, with this show, there’s not much time to do anything else.